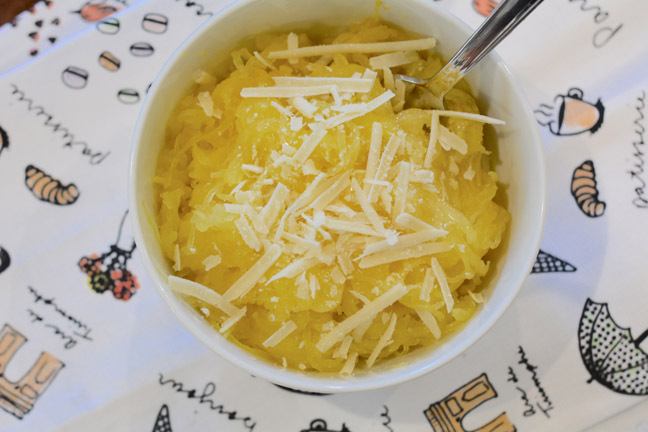 It’s squash season, and spaghetti squash is one of the most fun to make. It roasts up simply in the oven and then comes apart in sweet short strings that resemble spaghetti noodles. The flavor is sweet and mild and ideal for topping with sauces of all kinds. My kids love it when I top the strings with bolognese sauce, but my personal favorite is Parmesan sauce. It is buttery and cheesy with a generous dose of pepper. Making it is such a cinch; this dish is the perfect easy weeknight dinner for fall. Step 1: Heat the oven to 400 degrees F. Slice the squash in half, scrape out the seeds, and discard them. Place the squash, cut side down, in a baking dish. Fill the dish with about ⅛ inch of water. Place it in the oven and bake for 40 to 45 minutes, or until the squash is fork tender. Remove the squash from the oven and turn it back over and allow to cool for 5 minutes. Then use fork tines to shred the squash into strings and divide amongst two bowls. Step 2: While the squash is roasting, make the sauce. Add the butter to a small saucepan and melt over medium heat. Whisk in the flour and whisk for 1 minute until it is a light golden brown. Then whisk in the milk and cheese and stir until thickened on the back of a spoon, about 5 minutes. Add freshly grated pepper to taste. Drizzle over the squash and serve!